Quiet and unassuming over a morning cup of coffee, Rev is anything but on stage. Photo by Bailey Fucanan, who describes Rev as a P.T. Barnum and Criss Angel fusion. He hands a red staple gun — the kind you’d use to tack carpets down — to a guy in a bar — the kind of guy who might tack those carpets down — holding a dollar bill. The guy in the bar staples the dollar bill to his torso. The guy in the bar smiles, comes back with a five and staples it to his cheek. Why? Why would you let a stranger staple filthy currency to your body? Rev is a lanky guy with a mesmerizing presence. 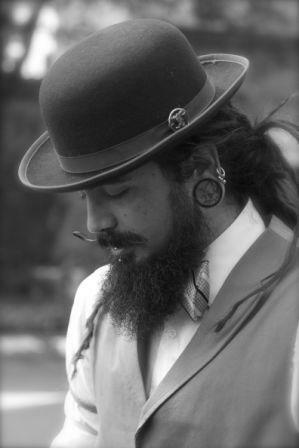 Piercings, dreads, tattoos, along with a handlebar moustache, bow tie and a bowler. He prides himself in his dichotomy, down to his carefully planned ink — right arm bedecked with religious icons, left with more “sinister” imagery. 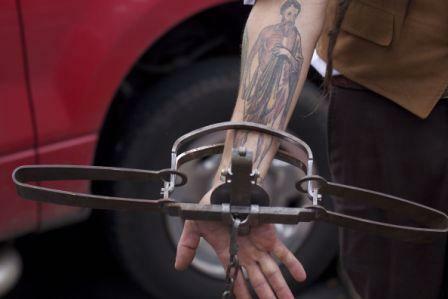 Rev’s right arm, in a fox trap, is inked wih sacred iconography. Here is St. Bartholomew, who was flayed alive. This part-Steampunk-part-rock-‘n-roll charisma comes to life on stage. The Reverend First Minister (a.k.a. Rev) is a showman. My guess is that he could talk his way out of, or into, any situation. My fear is the circumstances he willingly puts himself in. I’m the squeamish type. Evidently, his best audience, the kind that watches through our fingers, wincing. The Upper Black Eddy resident and four fellow entertainers form The Unholy Sideshow, a name that says it all. 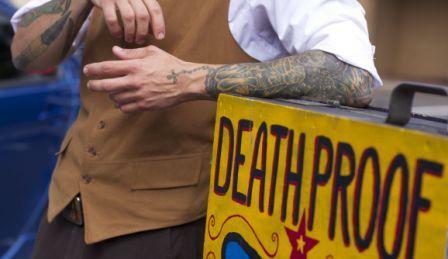 They perform wickedly irreverent feats of daring. Much of which I can’t watch. Some of which children shouldn’t, although the troupe can tone down their more risqué acts, and be quite entertaining for kids. Rev lets a 9-year-old and a mousetrap loose on his tongue. Joining Rev on stage are Davey Danger (few real names are used here – I’m setting aside good journalistic practices for today), a Pilates instructor also from Upper Black Eddy; Catalina Askew, an artist and burlesque dancer from Allentown; fellow Allentown resident Jay Sin Aces, a machinist who once raced BMX professionally; and Philadelphia’s Atlas Drugged, a former Navy nuclear engineer. Danger’s marquee act is hanging from his ankles while escaping from a straight jacket. 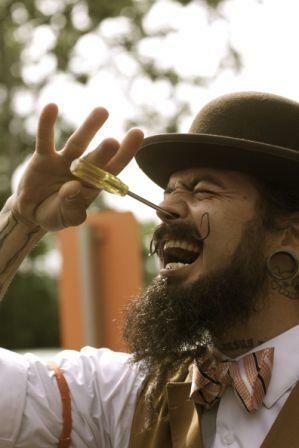 Askew is a “human dart board,” contortionist and fire breather. Aces excels at the bed of nails, often paired with breaking cinder blocks on his body. Drugged (yes, I just wrote that) is a strongman, trained in the traditional arts since age 12. As Rev talks about eating light bulbs, sticking hairpins through his face and walking on swords, I worry that it’s all an illusion, that I’m more gullible than I’d imagined. No one could do that to themselves and not faint or bleed out on stage. He assures me it’s all real. Could be an explanation for Michelle Duggar. Just a thought. When he opens his box of props, I’m nervous. Aw, geesh, don’t do it. But he grabs a screwdriver from the prop box and a hammer from his pickup (he’s a contractor by day) and hammers the screwdriver up his nose. I have nightmares about such things. Truly. I’m dumbstruck. Do you thunk about what you’re doing to your body? I think. Rev specializes in what he calls torture routines. His props include regulation mousetraps and fox traps. Needles and swords, all sharp. Light bulbs still in the packaging and an anchor purchased at a boat supply. That anchor? He hangs it from his tongue. The swords? He walks on them, blade up, of course. For him, it’s pushing the boundaries of what he can do. It’s a challenge. He seems ever ready to take on an exploit, saying he could walk on glass and swords just about any time, although during our early morning meeting, he does confess, “I’m not sure I want to eat a light bulb this morning.” Understood. There are some stunts, however, that he can only do while on stage. The adrenaline helps spur him on. And the crowd. He’s a natural showman, at ease with a crowd of sophisticate-wanna-bes at a sweet sixteen party, families at a state fair or a rowdy bunch at a tattoo convention. Not only is Rev the “pain-proof man” but he is the “talker.” He keeps the audience engaged. 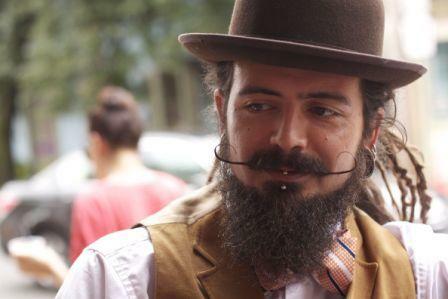 His innate ability to connect is how he got started in the sideshow biz. A friend was performing, but didn’t have the knack for addressing the crowd. Rev stepped in, to great success. It isn’t just banter that sets him apart. He can open a beer bottle with his throat, climbs a ladder of sharp swords 4 feet in the air and leaps off into broken glass. And his “face of pain,” involving needles and that anchor hooked through his tongue, is his signature act. No one else does it. There’s a reason. It would hurt. Rev has appeared on Science Channel’s Oddities and WMMR’s Preston and Steve show. Last weekend The Unholy Sideshow appeared at Jersey Shore Music Festival. August 3 they will perform on the new stage at Fran’s Pub in New Hope. Yes, the stapling. It worries her, especially the risk of infection. That guy in the bar, the one stapling a $5 to Rev’s cheek — he isn’t the only one smiling.